Given that North Korea flooded the airwaves and the press during our July 4 rituals—which grow more objectionably militarist every year, I have to say—you know by now that Pyongyang just launched a ballistic missile probably capable of reaching US soil. That was a first, on Tuesday. On Wednesday Kim Jong-un, the North’s 33-year-old leader, made sure his point was clear by asserting that his army’s new-generation ICBM is capable of carrying a large nuclear warhead. The “North Korean threat” has been by turns on and off our front pages since Donald Trump took office six months ago. Now it is decisively on, in my read. “Strategic patience”—Washington’s euphemism for having no idea what to do—has had its day, as the president and various members of his cabinet regularly declare. An administration that has yet to deploy a single coherent foreign policy in any context the world over now must figure one out. Tuesday’s launch is not so big a deal as Washington and its media clerks have made it: It is a step, no more, toward intercontinental capability. Kim’s claim on Wednesday is a maybe at best, even if the policy cliques find it convenient to take this one more seriously than others in the past. But there is no time left for dithering or denial: We know now that the danger of a nuclear confrontation between two exceedingly hostile powers is a few years off and drawing closer. A clearer case of reaping what one sows I cannot think of. Misconceptions, harebrained speculations, and belittling prejudices seem intrinsic to the US position on North Korea. Listening to the broadcast coverage Tuesday—wall-to-wall well into the evening—and then reading the press Wednesday, I was struck by the misconceptions, misperceptions, plain inaccuracies, and harebrained speculations that came across. These, along with the ignorant, belittling prejudices we are incessantly subjected to, are essential to the American position on North Korea. Washington’s case rests on fabrication and omission, in short. In the outer limits of commentary, the Dear Leader has his people enraptured by weird foundational myths and “mystical, magical powers”—this shard of Orientalism from someone who has been no closer to the North than the Potomac’s banks. Kim’s generals want to invade the South and drive the Americans back across the Pacific. And so on. Make that faux authority. Most of what you have read or heard in the past few days (just to limit our universe) is rubbish. Pyongyang should not think it is encircled? Please, ambassador, we spent four decades and some telling ourselves the same nonsense about the Soviet Union. (And the NATO generals are still at it.) No diplomatic solutions present themselves? That is the only kind there are. Responsibility rests with China? Wake up, Mark Bowden. That is called “kick the can,” a game with no end in Washington. Anybody who understands the genealogy of this crisis and is not beholden to the policy cliques knows very well the only impediment to a resolution on the Korean Peninsula is Washington’s unwillingness to negotiate seriously and hold to what it agrees. What is so easily cast as totalitarian paranoia is grounded in the experience of US brutality during the Korean War. I urge readers and viewers to note a few things common in all the press coverage and all expressions of official thinking on North Korea. One, more or less everything that is said will be ahistorical. Leaving out history, causality, agency, and responsibility was the irreducible Cold War template, as readers old enough to remember will know well enough. Plainly and simply, this is what we are served once again. The power of history to clarify is rarely so self-evident as it is in the case of Korea. This is why all we read, hear, and see in the media has this odd, flat surface—two-dimensional accounts, wherein nothing happened before yesterday. In his books and in his pieces here and elsewhere, Bruce Cumings, the perspicacious Chicago historian, has made the transformative force of history irrefutably clear—and so tips the official narrative upside down. (See here and here.) The case is not at all hard to grasp. What is so easily cast as totalitarian paranoia is well, well grounded in the Korean experience of America’s merciless brutalities during the Korean War—these understood by the easily available accounts of the generals responsible for them. The predictable consequences of American conduct since, bang on North Korea’s borders and off its shores, could hardly be more obvious. History: It is always one’s friend. Don’t leave home without it. So long as we insist on keeping nuclear weapons, others—most of all our adversaries—will develop them. Two, the elephant in the room since August 6, 1945, now grows fatter by the day. I refer to the irrationality of the hyper-rational—the illogic of the logic of nuclear weapons. Nobody wants to talk about the inevitability of their self-perpetuation. The world is haunted by these devices because—and at this point only because—those who have them decline to give them up while promising incessantly they want and intend to. Keep them, and others, most of all adversaries, will develop them. China, when we called it “Red China,” was such a case. Pakistan is a more recent example. Iran, faced with Israel’s nuclear arsenal, was due to become another. North Korea is an extreme case, but at bottom nothing more than a variant. We can put a trillion dollars into modernizing our nuclear weaponry, sure. No one can stop us. Do we think there is no consequence? We Americans, in the bubble we have inflated for ourselves and now dwell quiescently within, are far from reality in any number of ways. But are we this far? We have nuclear-armed missiles aimed at Pyongyang and lately let our twitchy fingers show. Now the North tests an ICBM and we hike up our skirts? Three, arising out of the above, there is the matter of deterrence. On this question the sound position is very simple. One must stand opposed to all that makes deterrence a necessity. But one must stand entirely for it when circumstances make it necessary to prevent conflict. In Washington now and in the press, people talk and write about the very finest points of a nuclear attack: If we can “take them out” in so many minutes, they may have so many minutes to do this, that, or the other. But if we do it this way, maybe not. What about “decapitation”—we go for Kim himself? Can you imagine how this comes over in Pyongyang? Nobody in Washington seems to give this question any thought. In sum, I do not approve of North Koreans’ new ICBM any more than anyone else’s, but I can see perfectly well why they built one, and satisfactory enough they have it until the United States drops the Strangelove act and gets serious about a solution. Deterrence: The old Cold Warriors taught me all about it. It is a small agony listening to people from the policy cliques and the poseur “experts” on television and in the press reason through Washington’s alternatives now that Pyongyang has taken a notable step forward toward real, reciprocal nuclear capability, meaning they might be able to do what we can do. Everyone says the same thing: 3 and 1 make 4, someone remarks. No, 2 and 2 make 4, says another. On the other hand, it could be that 1 and 3 make 4. I have not heard an original thought on North Korea in years. The most preposterous utterance of the week belongs to Nikki Haley, Trump’s out-of-depth ambassador to the UN. When the Security Council convened an emergency session Wednesday, Haley pronounced that Pyongyang’s latest missile launch is “quickly closing off the possibility of a diplomatic solution.” This statement is almost exquisitely upside down. If you can find the logic of it you are a better reader than I. 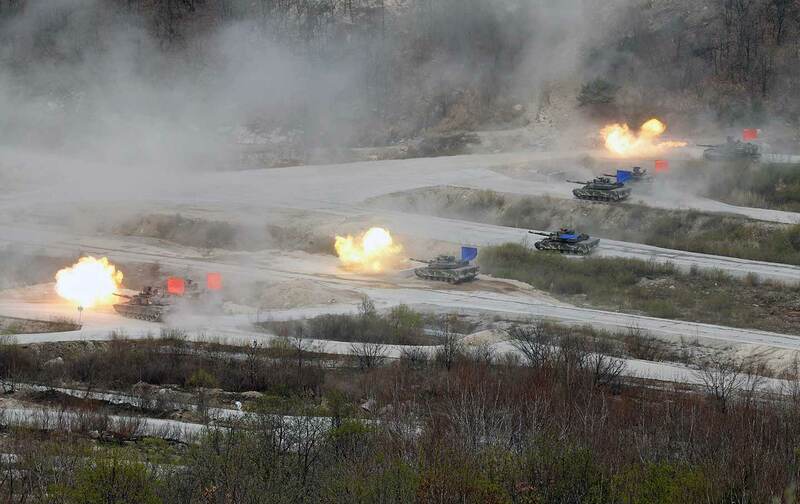 It comes to this: The United States would “take out” North Korea, casualty counts north of the 38th parallel be damned (just as in the early 1950s), if it could do so without risking casualties south of the parallel. It would love to “obliterate” the North—the word has been used. There is palpable longing at this point. But it cannot. To state what others come to after endlessly wringing sweaty palms, it is the mahogany table or it is status quo, and nothing changes in the latter case, while the North’s technological advances continue. In my estimation, Washington will eventually begin looking at the least embarrassing format. Bilateral is out, by that measure. China could play one or another role, but acting as intermediary is unlikely. Beijing’s tilt is to work with former allies during the Six Party talks, which Barack Obama ended (to his discredit). Those talks put South Korea, the United States, China, Russia, and Japan on one side of the table and North Korea on the other. Six Party now presents itself as a good alternative. Shortly after Pyongyang’s missile launch, Xi Jinping sat with Vladimir Putin in Moscow (a summit worth considering in another column) to call for calm and peaceful negotiation. Moon Jae-in, South Korea’s new president, wants to revive Kim Dae-jung’s famous “sunshine policy,” so he is on for talks. The Japanese, though still sadly diffident before the victor in 1945, favor talks but very quietly. As to the North, it has a long history of negotiations, and, until it signals otherwise, there is no reason to assume it does not remain open to them. A few weeks ago, Indian media reported that North Korea’s ambassador to Delhi hinted to Indian government officials that Pyongyang saw the basis of talks in the Xi-Trump dialogue—this before it turned sour. “It would be interesting to know if Prime Minister Modi carried some sort of message when he met Trump in late June,” a source in Delhi wrote at the time. It would, but nothing has been said—and nothing reported in the American press, interesting to note. I continue to think Kim Jong-un may look with curiosity at the Iran nuclear accord and wonder if he, too, could negotiate something like it. Among other things, it would help explain the increasing frequency of his missile tests since 2015. The South Koreans, the Chinese, the Russians, the Japanese, let us say possibly the North Koreans: Who among the immediately interested parties is left? Ah, the Americans. Lighting the world’s way once again, I see. In the end, maybe Donald Trump goes down as our first non-Wilsonian president since Woodrow himself (or TR, who managed to be neo-Wilsonian before Wilson invented Wilsonianism). We will see how Trump takes it when, at the Group of 20 session in Hamburg this week, he again presses Xi and Moon to do what they never, ever will. The true locus of this conflict lies between Washington and a negotiating table somewhere across the Pacific. We come to the nub of the North Korea question. The true locus of this conflict lies between Washington and a negotiating table somewhere across the Pacific. It is a fight in defense of American primacy. It is the American policy elite resisting the limits to American power the 21st century imposes even as we speak. In this the confrontation with North Korea—which is at bottom a confrontation with China—ranks with Ukraine and Syria. The three are fundamentally similar in character. As in Europe, then as in the Middle East, so now in Asia: Washington wages rear-guard actions to preserve a prerogative that rests, finally and only, on military might. Ukraine, Syria, North Korea: Take these three together and they mark a very critical turn in our great nation’s place in the world. We must not miss this moment’s significance. Yet one cannot decide: Do the policy cliques in Washington so badly misread all three of these questions such that they have matured, in consequence, into full-dress crises? Or do they read them very well and are ruled by a desire to preserve American preeminence as long as possible and at any cost? I tend to the latter view but do not rule out the former. They are not, at the horizon, exclusive of one another. On this point I find more certainty: Washington cannot possibly win its fight in defense of unchallenged power, whatever form its defeat eventually takes. Three negotiating tables await, not just one somewhere in Northeast Asia. American officials resist sitting down in all cases. In my read they cannot hold out indefinitely, and when they cave it will be a good thing for Americans as well as everyone else. In defeats lie our victories: We must embrace this. It will be so for some years to come. Editor’s note: The text has been corrected to say that after Pyongyang’s missile launch, Xi Jinping met with Vladimir Putin in Moscow, not Beijing.